One of the important things to consider when looking into owning a business is the future viability and longevity of your product and the prospectus of your particular market. To put it simply, the data being collected in the experiment of legalizing recreational Marijuana is the foundation for determining whether or not Dispensary Ownership would be a sound investment. Another sign that cultural trends are going to continue to prove an investment in the Marijuana industry is a wise maneuver, and one that has gotten the most publicity lately, is the data showing crime has gone down since the start of legal sales of recreational Marijuana in Colorado. One of the most basic things to understand about statistics is that it is very difficult to prove a relationship between variables. Meaning, just because the data shows that crime has gone down since marijuana sales have been legalized for recreational use, doesn’t mean we can prove that the reduced crime is BECAUSE of the legalization of recreational marijuana. Nonetheless, the numbers themselves are factual, and at the very least it doesn’t provide evidence to the nay-sayers of legalization who try to perpetuate the brainwashing concept that somehow you could conclude that legalization of Marijuana would lead to an increase in crime rates. These trends are very encouraging of those looking into becoming Dispensary Owners and Business professionals in the Marijuana industry. Also undeniable are the tax dollars that have been generated and the direct improvement in funding for schools that all current and future Marijuana Dispensary Owners can be proud of. The state sold nearly $19 million worth of recreational pot in March, up from $14 million in January and February. 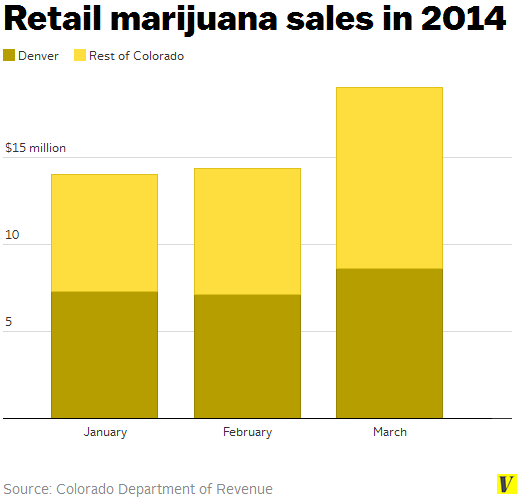 For all three months, Denver County made up about half that revenue. That Denver makes up such a huge chunk of the state’s marijuana revenue isn’t really surprising, as almost 60% of marijuana licenses are in Denver. The Denver Police Department’s crime data shows that violent crime from January through April dropped by 5.6 percent compared to the same time period last year, and robberies in particular fell by 4.8 percent. 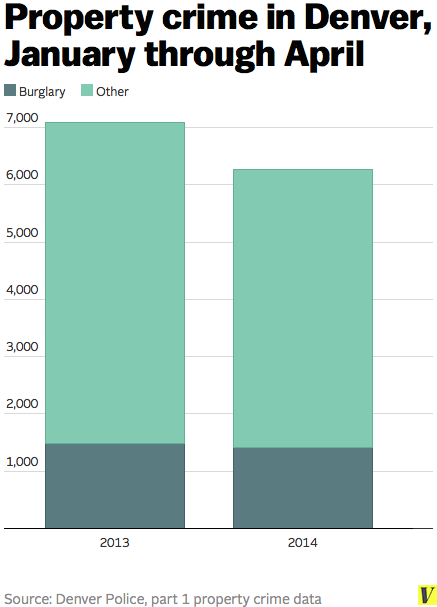 Major property crimes also dropped by 11.4 percent, with burglaries falling by 4.7 percent, compared to the same time last year. The Young Turks give a nice 5 minute run down of the data and what it means. “Three months into Colorado’s historic legal recreational marijuana sales, crime hasn’t gone up in Denver, according to recent data released by the city. 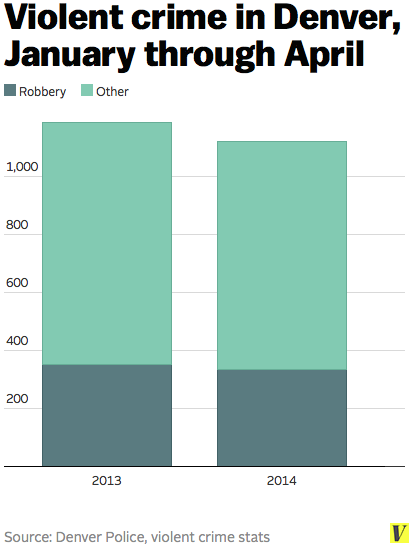 Overall property crime in the first two months of 2014 fell by 14.6 percent in Denver compared to the same period of 2013. There wasn’t as dramatic of a shift in overall violent crime rates for the same period, but they were still down by 2.4 percent. I heard on the news that Oregon and Alaska are the next state to legalize Marijuana. I don’t use or smoke but I’m interested to know or have information to do a business legally. Any information is I get is highly appreciated. Thank you south.